"BY High is the classiest high school I have ever seen before or after I attended. I am only sorry that my three boys could not have attended this remarkable school. The memory of the uncommon dignity of the surroundings and of the faculty is still very much alive in my mind. I am very glad, and probably a much better person, for having attended Brigham Young High School." The inevitable tedium of our daily round of classes was often broken by events deliberately designed to shock us awake, help us become better acquainted, and move us out of our comfort zones. Assemblies, for example, were doubly welcome, first because they meant less time in classes, and second because they provided memorable experiences for assembly performers and audiences. The year began in September with an Opening Assembly, kangaroo court and opening social, just three of the traditional "Hi Week" activities. As the school year progressed, each class performed an assembly just before the school dance that was sponsored by that class. Dances included the Sophomore Ball and the Junior Prom, and a senior dance. 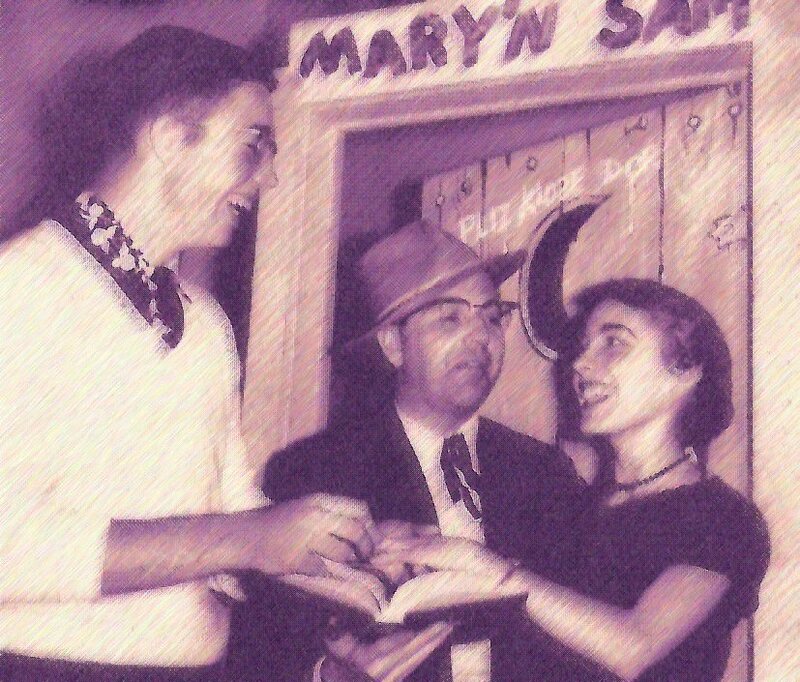 The seniors sponsored a Senior Hop until the 1960's, when the name was changed to Senior Ball, but in some years both were held. The assembly schedule varied each year, guided by our Assembly Managers or Assembly Committees of the Student Council. Typical fare included Fall, Winter and Spring assemblies featuring outside performers, such as musicians, scholars or magicians. Whenever one of our sports teams, music groups or speech groups won a championship -- a frequent occurrence -- a special Honor Assembly was called to spotlight the proud students and our teachers, and to receive the trophy to be displayed in the large glass display case in the main hall. Election Assembly (final campaign speeches before the Election Dance). During at least one year a Civil Defense Assembly was held to instruct us about what to do in case of atomic war - "duck & roll!" -- near the time of the Cuban missile crisis. Finally, at the end of each year our Annual Awards Assembly honored the year's top achievers. We were invited as individuals to enter dozens of contests, including: American Legion Oratory Contest, Beard Growing Contest, Betty Crocker Contest, Essay Contest, Foreign Language Fair (German, French & Spanish contests), I Speak for Democracy Contest, Industrial Arts Contest, Little Louve Art Contest, Make It With Wool Contest, State Math Exam, National Math Exam, National Merit Scholarship testing, Poetry Contest, Poetry Festival, Science Fair, Short Story Contest, Soloist Instrumental, Soloist Vocal, Sons of the American Revolution Public Speaking Contest, U of U Photography Contest, U.N. Essay Contest, Utah State Art Show, and the Voice of Democracy Contest. Many other off-campus contests were open to BY High Students. During the 1940s, 1950s and early 1960s varsity team competition was available to boys only. These sports included Football, Basketball, Baseball, Track & Field, and Tennis. Several boys over the years also participated in Golf. Wrestling was not added as a varsity sport until about 1954, but it became very popular, particularly with football players. Then in the mid-1960's a Girls' Athletic Association (GAA) was organized, and girls were able to compete in six sports: Basketball, Hockey, Softball, Track & Field, Gymnastics and Volleyball. In addition to traditional sports, physical education classes provided samples of activity in swimming, bowling, touch football, horseshoes, roller skating, rope-climbing, soccer, boxing, running laps, and that old favorite, calisthenics. Although BY High was always a very small school, we attracted good athletes from larger communities. It was considered a major achievement to be selected for a team, and an even greater achievement to letter in that sport. Top individual athletes were honored by being selected to All Region Teams or All State Teams, by being honored by the Provo Daily Herald or by the Deseret News as a member of one of their published honorary teams. At the Annual Awards Assembly, All-Around Best Athlete awards were presented. BY High home basketball games were usually played in the world-class George Albert Smith Fieldhouse, and football games in the old hillside Cougar Stadium or in the new Cougar Stadium after it was opened. Several clubs were open to girls only. The Notre Maison ("Our House") club existed from the 1940s until the late 1950s, when it suddenly disappeared. The Fauvines (named for a type of bird, the fauvine des pins, or Olive Warbler) also existed through the 1940s but vanished in 1954. Each year the Fauvines recruited a drummer, either a boy or a girl. The Pep Club appeared in 1954, probably replacing the Fauvines. Pep Club members wore uniforms on game days and to games, providing a dependable cheering section for the boys' teams. Like the Fauvines, they recruited a drummer each year. The Pep Club also developed drill teams that performed at half-times and at pep rallies. The drill teams became known as the Hi-Steppers and the Twirlers. In addition to the Pep Club, at various times over the years Pep Boosters and Pep Committees appeared, usually with male membership. The all-female Home Economics Club appears to have become the Future Homemakers of America (F.H.A.) from 1961 on. F.H.A. started each year with an Opening Tea, sponsored the Harvest Ball in October, then closed the school year with a Mother and Daughter Tea. There were several clubs open only to boys. The major one was the Lettermen Club, open to members of teams who also met participation minimums to qualify for a letter "Y" on their jackets. 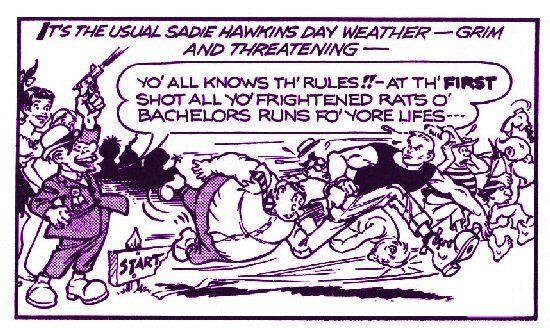 Lettermen initiations were legendary, requiring the athletes to wear dresses, hang onions around their necks, ingest foul concoctions, and participate in other disgusting and painful rites. Some boys who lettered in sports declined to join the Lettermen's Club. In the 1960s this group was sometimes called the "Y" Club. The Lettermen pose on the front steps. 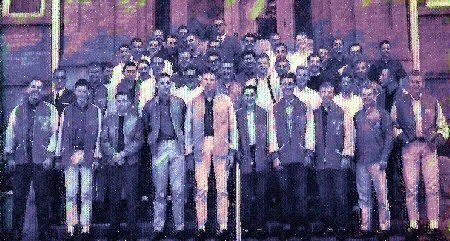 Another boys only group was organized in 1961. 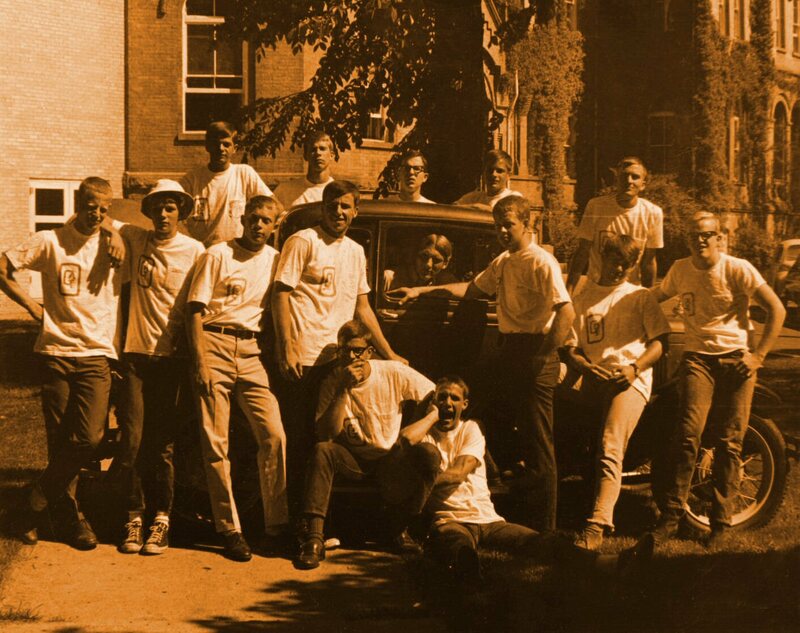 The school spirit club was called the Sons of Brigham, and it continued for two years, ending in 1963. Clubs open to everyone included: Art Club, Beaux Arts Club, Bookkeeping Team, Camera Club, Chemistry Club, Chess Club, Children's Theater, Chorus, Debate Club, French Club, Future Teachers of America (F.T.A. ), German Club, Gun Club, High School Bowl Team, Key Club, Les Amis (ended in 1952), Library Club, Model U.N., National Honor Society, Newspaper Staff (usually called the Y'ld Cat), Opera Club, Photography Club (or in some years, Photo Club), Quill & Scroll, Radio Physics Club (or in some years, Radio Club), Red Cross, Rocks & Minerals Club (beginning in 1955), Roller Skating Club, Safety Council (beginning in 1960), Science Club (beginning in 1963), Seminary, Shop Club, Ski Club (beginning in 1950), Spanish Club, Student Council, Symphony Debonaires (beginning in 1966), Thespians (beginning in the 1940s or earlier), Typing Team, and the Wildcat Yearbook Staff. 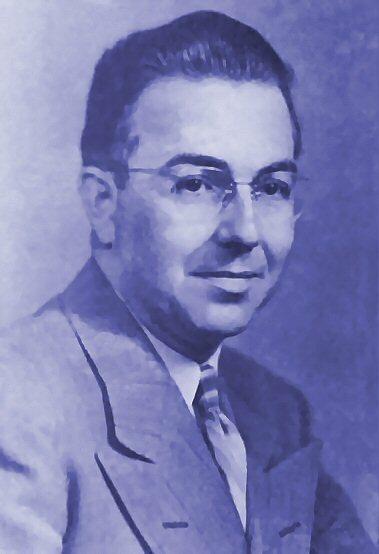 One of the toughest titles to earn from the 1940s through the 1960s was Mr. Willy, name of the Wildcat sports mascot. This person showed up at every football and basketball game dressed in a hot, stuffy costume. He or she performed dances and sometimes gymnastics as part of the cheerleading team. The identity of each of these self-sacrificing individuals was kept relatively secret until the end of the year. Prior to basketball and football games, Cheerleaders, the Pep Band, the Pep Club, Hi-Steppers and Twirlers gathered the Student Body together, usually on the front steps of the Education Building, where they led cheers and encouraged everyone to attend the game and support their team. Victory dances were held after some home football and basketball games. Another highly respected activity for all students was participation on an important committee. They included: Assembly Committee, Sophomore Ball Committee, Junior Prom Committee, Senior Hop or Ball Committee, Senior Class Fundraising Committee, Senior Sluff Day Committee, Graduation Committee, Party After Graduation Committee. And there were committees within the committees: tickets, refreshments, decorations, advertising, floor show, fund raising). Some of the more unique roles filled by students over the years included: KOVO Reporter (beginning 1954) and KSL Correspondent (beginning 1966), along with stringers for the Provo Daily Herald, Deseret News, and Salt Lake Tribune. Some of these stringers provided sports photos. It was also considered an honor to be one of the Banner Carriers for the Marching Band (1950 to 1968), and a Drummer for the Fauvines (up to 1954) and the Pep Club (1954 on). The Marching Band also designated a Drum Major or Drum Majorette each year. The drill teams started with Drill Masters who, since they were all females, eventually came to be known as Drill Mistresses. Since the 1940s, the Athletic program designated a student to serve as the Athletic Manager, but over the years these became more specialized: Football Manager, Basketball Manger, Track Manager, Baseball Manager, and so on. A few students also served as Debate Manager, Stage Manager, Art Manager, or Drama Manager. Top student pianists considered it a special honor to be chosen as Accompanist for either the Band or the Chorus. 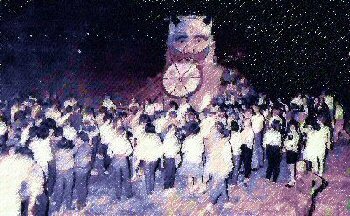 Several of the most anticipated and best attended events each year were the concerts, usually on cold winter evenings, performed by the Orchestra or Band under the direction of long-time instrumental music teacher William Mathis, and by the Chorus, sometimes designated the A Capella Chorus, under the direction of long-time vocal music teacher Fred Webb. Maestro Webb shocked younger students when, at the end of each concert, he took a deep bow, allowing his combed-back hair to fall forward, revealing a shiny bald spot that had remained hidden every other day of the year. When the audiences became too large for College Hall, performances were moved to the Joseph Smith Auditorium on the upper campus. 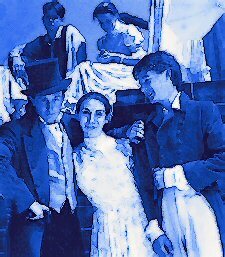 Another landmark event each year was the performance of the School Play. So many students participated on stage or behind the scenes that few students remained to make up the audience -- but parents and friends filled the College Hall auditorium to overflowing. BY High enjoyed legendary speech and drama teachers including George Lewis, Lynn Benson and Kenneth Bowthorpe. Many smaller plays and ensemble performances were prepared each year, including reader's theater performances in the Little Theater. When BY High students listed their favorite activities, it appears that more than half of the Student Body participated each year in the Chorus and in the Children's Theater. GIRLS STATE / BOYS STATE / MODEL U.N.
For many decades, the American Legion sought to teach high school students what it feels like to attend legislative sessions and learn about how politics might work. It was always considered a top honor for juniors to be selected at the end of the school year to attend the summer Boys' State and Girls' State sessions in the State Capital in Salt Lake City. Two to four boys, two to four girls, and several alternates were designated, in case the primary delegates could not go. At the sessions, delegates could run for offices such as senator, representative, commissioner, governor, etc. A similar program with an international emphasis was called the Model United Nations. Sessions were held at various universities, and many students from BY High participated over the years. The program disappeared in the mid-1960s. Election to office by our fellow students was one of the best compliments a student could win. In the 1940s, a typical class elected a President, Vice President, Secretary and one Social Chairman. In 1950 and 1951, two social chairs were elected. In 1952 only three Senior Class officers were elected: a Governor, a Secretary of State, and a Secretary of Records and Treasurer. This evolved in 1953 into an elaborate organization with a House, Senate, Supreme Court and Cabinet. Two secretaries of Social Affairs were added to each class. However, by 1954 the Senior Class student government reverted to its classic form: President, Vice President, Secretary and two Social Chairs. The Freshmen, Sophomores and Juniors were similarly organized until the school closed in 1968. The one class office that retains a life-long responsibility is the Senior Class President, who was forever after charged with organizing and holding class reunions. The ultimate in electoral honor at BY High was for a student to be elected a Student Body officer. In the 1940s, the Student Body officers included a President, Vice President, Secretary and one Social Chairman. In 1950, a second Vice President was added. By 1953 cheerleaders were added as Student Body officers, and the Student Body officers were called the Cabinet. In 1954, the structure reverted to classic offices, with a few new ones added: President, Vice President, Secretary, Social Chairman, Speech Manager (stage manager), Historian, Business Manager, and Advertising Manager (publicity for activities). This group of Student Body officers was usually called the Executive Council. The Student Council included the executive officers listed, plus Yearbook Editor, Newspaper Editor, and various Sophomore and Junior class officers. The composition of the Student Council changed from time to time over the years (with homeroom representatives, or departmental representatives from groups such as Band, German, Physics, Art, Home Economics, Seminary, English, Social Studies, etc.). 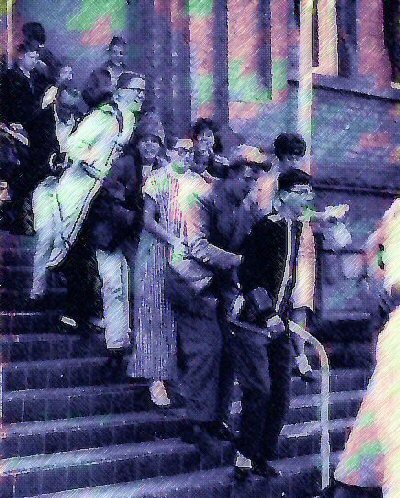 However, the basic Student Body officer structure remained about the same until the doors of BY High were closed forever in 1968. From time to time students started clubs or groups that served a purpose, but did not continue. 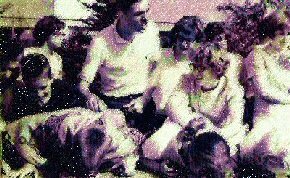 The Canadian Club (1950) was organized because some Canadian students came to BYU without having fulfilled one or two basic requirements such as the US History requirement, etc., and so some Canadians attended classes at BY High. Because these students usually attended for only one year or a part of a year, continuity was sketchy. The Dave Club existed in 1957 only. According to Larry King, Class of 1957, its membership included: Dave Grow, Dave Morrill, Dave Sorensen, David Jacobsen, David Ross, and Dave Hamblin. 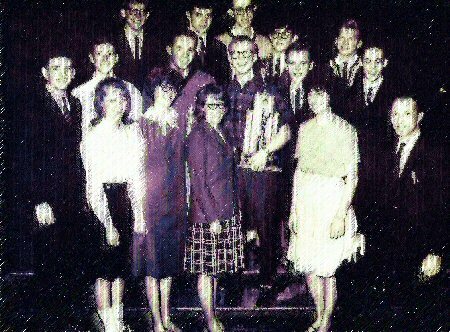 According to David Hamblin, the Dave Club was nothing more than a joke in the halls among the six Daves in the Class of 1957. They never did anything beyond that. The G & A, Ltd. was loosely organized in 1965 and 1966 as a group of actors and musicians who created a filmstrip called "The Pharoah" -- a satire of the dozens of low-budget seminary filmstrips that formed an important part of the curriculum. Administrators at first approved a showing of the rather harmless film on campus, but had second thoughts and the first showing was held in a private home off campus. The group also made an 8 mm film called, "The Most Great & Abominable Story Ever Told" which was a sort of film yearbook. The BYH Rod & Gun Club was organized in 1954 by Chuck Hackley and some of his friends. It was highly active, but after a few years passed out of existence. Looking back from Columbine, it is amazing that such a club was allowed -- but students with guns were trusted in those days. Les Amis (1950 to 1952 only). We need alumni from the early 1950s to tell us the story of this club. The Sons of Brigham (1962 to 1963 only). At about this time, a high-powered all-male pep club was organized at BYU called "The Brigham Brawlers." They wore uniform blue sweatshirts and attended football and basketball games as a block. Their unique cheers and well-rehearsed performances added humor to athletic events, and they were highly admired, particularly by high school students. Perhaps the Sons of Brigham group was formed with similar purposes, and it added a lot of flavor to the years when it existed. We'd like to have a photo of the members. Student musicians at BY High had a wide variety of vocal and instrumental groups to join. They include the senior high school Band, the junior high school Cadet Band, the Concert Band, the Dance Band, the Marching Band, the Pep Band, many small ensembles, and the Orchestra. Many students participated in three or four of the groups. Frequently these groups were named All Region Band and All State Band. The popular Chorus also included many small ensembles. Sometimes the Chorus was called the A Capella Chorus, and it also frequently won All Region and All State honors. Some top performers were invited to participate in BYU music groups while still in high school. The Forensics Team included two person Debate teams who researched day and night on the nationally designated annual debate topic. At debate meets, they would move from Pro to Con, debating other teams until the judges named winners. Legislative Forum participants studied Roberts Rules of Order, learned to write legislative bills, and then attended forums where they presented their bills and worked to win their adoption. Extemporaneous Speaking involved preparing for a selection of topics, they were given one topic with almost no preparation time before speaking before the judges. The Interpretive Team included those who delivered polished orations, dramatic readings, humorous readings, radio reading (handed stories to read with little time to rehearse), and retold stories. The Drama Team prepared Contest Plays and performed them at Region and at State drama festivals. These were usually one-act plays. These actors and actresses also played major roles in the annual School Play, in the Children's Theater, and in the Thespian Club. The Thespians were known for their highly visible initiations, when they wore outlandish costumes and gave impromptu performances on demand. Each year the Drama Department named its own Best Actor, Best Actress, Best Supporting Actor, Best Supporting Actress, etc. Homecoming Week included many traditional activities. Noon hours featured carnival-type activities such as dunk tanks, three-legged races, chicken chases, a greased pig chase, and a greased pole climb. Recent grads performed an Alumni Assembly. Students got up before dawn and trekked up Y Mountain with large rolls of white paper. With the paper they wrote "HS" or "High" next to the big block "Y" -- inevitably infuriating uninformed BYU students who jumped to the conclusion that University of Utah students were defaming BYU. Anti-Viking wood stack stands thirty feet high. An enormous pile of wood was torched during a bonfire pep assembly the night before the annual Homecoming football game. After the game, the Homecoming dance was held and the Homecoming Queen and attendants were named. Sophomore Week took place in December, and included the Sophomore Assembly and the Sophomore Christmas Ball, including the naming of sophomore girls as Miss Merry Christmas and attendants. There is no record of a Mr. Merry Christmas ever being named. After a long hard winter, the Annual Field Day provided a day of enforced outdoor games and activities for students and faculty alike. Competitions of all types were held on a field near BYU, including races of every conceivable type, tug-of-wars, softball games, water fights, etc., until everyone was exhausted. Refreshments and lunches were provided. The faculty quickly retired to the sidelines and became day-long spectators. The Seniors sometimes organized a Senior Sluff Day as a day off from the pressures of endless tests and preparation for graduation. Activities varied so much every year that generalizations can't be made about them. Graduation Week involved final testing and preparation for Commencement Exercises, usually held in College Hall or in the Joseph Smith Auditorium on the upper campus. A senior committee planned a Party After Graduation, and some years this was stretched to include a several-day bus trip to an amusement park or to the national parks in southern Utah. Examples:Betty Crocker Homemaking Award, Sertoma Club Award for Service, Girls' State & Boy's State, Mathematical Association of America Award, Danforth Foundation Award, BYU Bookstore Award, Anna B. Hart Award for Creative Writing, Citizenship Medal from Sons of the American Revolution, Art Purchase Award; Civic Service Award by the Women's Club; Elks Club Leadership Award; National Honor Society. Examples: BY High Scholarship awards, Honor Roll awards, Six-Year Scholarship awards, Seminary Scholarship awards, scholarships awarded by universities, scholarships awarded by the National Merit Scholarship program, and scholarships awarded by civic clubs. Beginning in the early 1960's, two awards were presented by each of the following departments: Art, Athletics, Business, Drama, English, Forensics, Home Economics, History, Instrumental Music, Industrial Arts, Journalism, Language Arts, Library, Mathematics, Physical Education, Science, Seminary, Social Studies, Speech, Vocal Music. Some clubs also followed suit, for example, the Hi-Steppers sometimes awarded Service and Achievement awards. Three types: Junior High (8th Grade) Boy & Girl; Senior High Award (12th Grade) Boy and Girl; and Senior High School Outstanding Boy & Outstanding Girl, sometimes called Representative Boy & Representative Girl (these awards were wrist watches). To participate on the yearbook staff or on the newspaper staff, students usually signed up for journalism or publications classes. Some students outside of these classes volunteered their help. The key to the success of these publications was a highly organized student staff, but even more important was a highly dedicated Faculty Advisor who insisted that everyone meet their deadlines. The journalism teachers rotated frequently because this was a major job for them, involving many after-school hours, and perhaps some burnout. The yearbook was traditionally called The Wildcat and the newspaper had several names. Some early editions were called The Banter and later it adopted its traditional name, The Y'ld Cat.In 1965 the newspaper name was changed to The Latter Day Sun, and changed again in 1966 to The Brigadier, the name that continued through the end of the school. Had we known of its long tradition, we probably would have chosen to go back to the Y'ld Cat name. One of the most popular student publications was the annual telephone book, which included names, addresses and telephone numbers for all students, eighth through twelfth grades, and all faculty. The cover shown above is signed "JP" which probably means it was designed by Jim Petty. Occasionally a literary magazine was prepared and published, but the name and frequency of such a publication was so varied that it could not be called a traditional annual publication. One of the great advantages of being a student at BY High was the fact that your student activity card was accepted on the BYU campus as equal to that of a BYU student activity card. This meant free admission or low-cost admission to all athletic events. Basketball games in the George Albert Smith Fieldhouse and football games in the hillside Cougar Stadium were usually well attended by BY High Students. In addition, the University Library was completely open to us, including the music listening library. Plays, musical performances, art shows, movies, and other BYU student activities, were all available. Some BY High students became so involved at the university that they produced articles, political cartoons and letters-to-the-editor that were published in the BYU Daily Universe newspaper. Because of these open doors, the transition from high school student to university student was usually much easier for BY High alumni. Just a few details to jog your mind -- Wake up, the teacher's coming back down the hall!